More reminiscent of a Hayao Miyazaki film than previous Pixar fare, Up follows the unlikely adventures of 78-year-old Carl Frederickson (Ed Asner) and his side-kick, the bouncy pubescent Russell (Jordan Nagai). Borrowing some Miyazaki trademarks - flight, a steampunk aesthetic, some environmentalism vibes and a quasi-magic(al) realist mythical quality - Up is one of the more unorthodox films from a film company that specializes in the unorthodox. Up furthermore up-ends (no pun intended) the typical quest pattern by shifting the focus away from the young, naive hero and to the wise old man figure. Imagine Star Wars told from Obi-Wan Kenobi's point of view - or Lord of the Rings from Gandalf's - or The Matrix from Morpheus'! It is definitely refreshing. And, because of its unorthodox narrative, we found ourselves pretty lost in the woods - unable to predict the usual story cues. At least for the first half. Manohla Dargis at the New York Times laments that eventually by its second half, Up settles back into the mainstream hero pattern of "stock characters and banal story choices". One of the most wonderful, magic(al) realist images. To some extent, this is true. 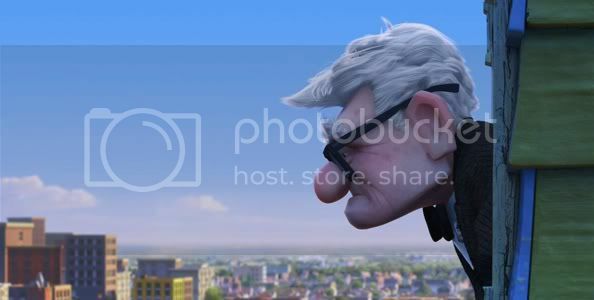 Up begins with a brief, poignant prologue about Carl's life: his childhood obsession with celebrity explorer Charles Muntz (Christopher Plummer), his courtship and marriage to the love of his life, Ellie (Elie Docter). When we catch up with Carl in the present, Ellie has passed away and his beloved home is threatening to get swallowed up by the rapid urbanization around him. 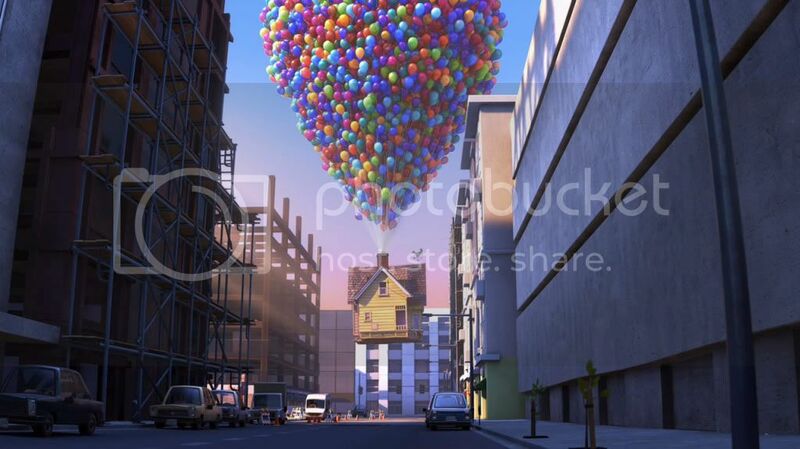 In a last-ditch effort to get free of the clogging city and looming retirement home, and to fulfill his and Ellie's old dream to visit the legendary "land lost in time" in remote South America, Carl ties a kabillion multi-colored balloons to his house and sets off. Along the way, he unexpectedly picks up one pudgy and adorable "wilderness explorer" (i.e. Boy Scout), Russell (Jordan Nagai), as well as a talking dog, Dug (Bob Peterson), and a large mythical bird, "Kevin". This is all very strange and marvelous and funny (especially the talking dogs), but then the film starts taking the usual story route. Unlike Ms. Dargis at the NY Times, this was fine for us. 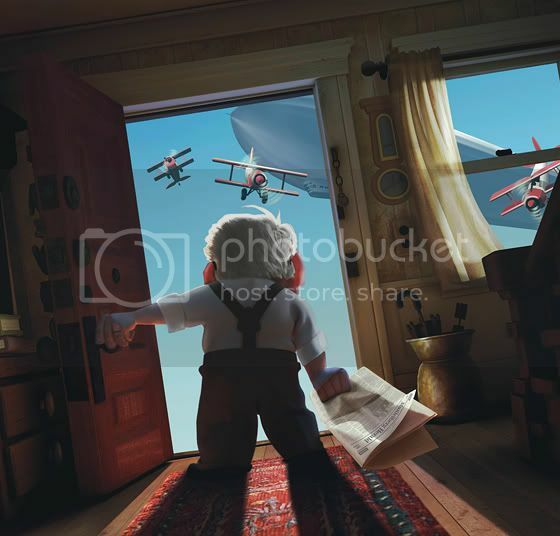 The major themes were all resolved just as they should have been - for example, the Ellie/house parallels and how Carl finally heals his grief by, literally, unburdening his shoulders, or the typically Pixar intense philosophical undertone (this time about how the mundane can be just as memorable as the adventure). And while we didn't laugh or cry as much as we did during, say, Finding Nemo, well... Finding Nemo was a whirlwind! It was killer on our emotions, and we recall many screaming children beside us in the theaters. And all we can say is: scream on, kid, Papa Marlin losing Nemo was traumatizing! Up is, thankfully, a lot more relaxed and gentle: no violent swings of children lost and found. Instead, it has the touching humanity of showing that old people are more than just "the elderly" - they're people too! Art and storytelling is too much dominated by the young and fit and mainstream, and showing people who are past their prime - or perhaps never had a prime! - has a lot of poignancy and relevance. Also showing that death is a natural part of life, and that life goes on, is touching and a healthy reminder for kids of all ages. ALPHA: Do not mention Dug to me at this time. His fool's errand will keep him most occupied. Most occupied indeed. Hahaha! ...Do you not agree with that which I am saying to you now? BETA: Sure, but the second master finds out you sent Dug out by himself, none of us will get a treat. ALPHA: You are wise, my trusted lieutenant. Really want to see this one and Coraline too (love the book). Have recently been watching even more Miyazaki: Nausicaa of the Valley of the Wind, Kiki's delivery service, Laputa: Castle in the Sky...such joy, and I still have a couple in the bag! I dont care if it was banal and typical in the second half, I LOOVed it! 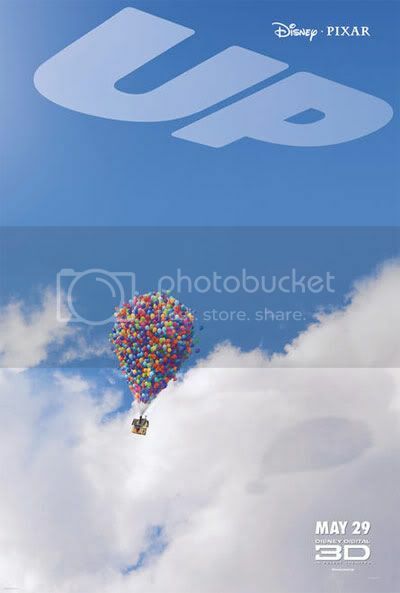 the image of the balloons was just so beautiful almost as gorgeous as Wall-e! And the opening montage, u'd have to be stonehearted not to cry during that! Miyazaki rocks! Have seen all his films but Porco Rosso - and loved every single one of them, My Neighbour Totoro being the fave. Your screen caps are, once again, very attractive. A friend of mine just saw it and loved it---I want to see it just for the dogs! Ooh, nice! I was discouraged from seeing this by a coworker, but now have renewed hope from your review. I love that I can visit your blog for updates on the films I love as well as the ones I can take my daughter to, btw. bawa - What's Coraline? And ahhh, Miyazaki is so great. I liked this a lot solely because of the Miyazaki vibes. Memsaab - OMG the dogs were my favorite part. I want to talk like them now. If you like Miyazaki, My Neighbour Totoro will blow you over. I warn you though that it is unlike many Miyazaki films in some ways..just a very gentle story that uses a lot of traditional Japanese folk stories, and some aspects are based upon his real life experiences. Btw, am going to Tokyo this summer and have already bought the Ghibli museum tickets, (dances in delight). Coraline is based on on a book of the same name by Neil Gaiman, a really really talented and imaginative British author who lives in the States, writes both for children and adults (Stardust, American Gods, The Graveyard Book). Coraline is filmed in 3-D but not released in Spain yet-we have an IMAX 3-D here, so it should be great!